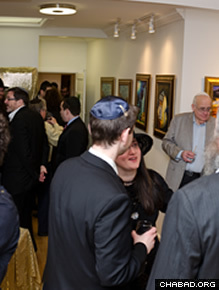 Located in the all-purpose area, the gallery adds an artsy feel to the Chabad center. Nestled among the boutique bars and bookstores of the trendy Monkland Village section of Montreal, Chabad of NDG has become the “go-to” place for Jewish art. In early 2012, Chabad opened the Monkland Art Gallery with the first rotating exhibit featuring Montreal artist Jamie Shear. Every month, the gallery features the work of another Jewish Montrealer, showcasing an eclectic mix of paintings and photographs by both aspiring artists and established painters. He adds that every new exhibit starts with a vernissage, or preview of an art exhibition, featuring wine, cheese and the chance to interact with the displaying artist. “There are people who came through our doors for the very first time at a vernissage,” says Bernath. Artist Haim Sherrf, whose exhibit included a black-and-white series, as well as a klezmer scene created using a “spatula technique,” says his gallery preview proved refreshingly different from the norm. Every new exhibit starts with a vernissage, or preview of an art exhibition, featuring wine, cheese and the chance to interact with the displaying artist. Sherrf, a Chassidic Jew, says the gallery fit well with his raison d’être—using his artistic gift to connect people to their Jewish roots. 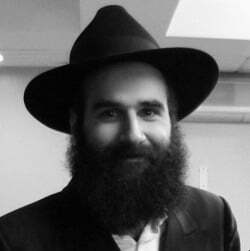 In fact, the Lubavitcher Rebbe—Rabbi Menachem M. Schneerson, of righteous memory—told him many years ago that art would be his life purpose, serving as a living example of Judaism. This is apparent in the current exhibit, which features photos Bernath shot on a recent trip to Israel. Titled “My Land: A Photo Journal of the Land of Israel,” each photograph and caption seeks to connect viewers to another aspect of the Holy Land. For example “Dear G‑d” is a close-up of notes stuffed into a crevasse in the Kotel, the Western Wall. The caption explains how Jews who pray at the wall customarily leave notes with their prayers and wishes in cracks in the ancient stone wall, built by King Herod more than 2,000 years ago as a support for the Temple Mount. The notes depicted were written by Jews from Montreal and inserted into the wall by Bernath. In “My Land: A Photo Journal of the Land of Israel,” by Rabbi Yisroel Bernath, each photograph and caption seeks to connect viewers to another aspect of the Holy Land. “I never thought of myself as an artist,” says the rabbi, who seemed surprised by the high volume of interest—and sales—his display has generated.